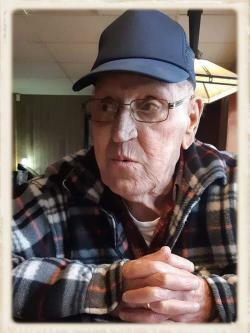 The family of Emmett Joseph Handrahan are saddened to announce his passing at the Dr. Everett Chalmers Regional Hospital on Monday, March 18, 2019 at the age of 77. He was born at Tignish, PEI on March 1, 1942. Emmett was a much-loved and respected Custodial Worker who’s gentle, welcoming and friendly manner will be long remembered by those lives he touched. He was a hard worker and put his whole heart into any task he was asked to do. A job well done Emmett! Emmett leaves behind his much-loved and cherished daughter Lisa Handrahan (Nick Mason) of Rusagonis. He was so proud of his amazing grandson, Shane Messer of Fredericton. Emmett was a dear brother to Stephen Handrahan (Judy) of Benton, NB and Marjorie MacRae (Bob) of Summerside, PEI, also a brother-in-law George Gallant of Fredericton as well as a number of nieces and nephews. Emmett was predeceased by the love of his life in 2014, the former Lynda Carol MacMillan; a sister Marie Gallant (2017) and a brother Earl Handrahan (2016). The family will receive condolences at Bishop’s Funeral Home, 540 Woodstock Road, Fredericton on Friday, March 22, 2019 from 12:00 Noon until 1:45 PM. A celebration-of-life service for Emmett will be held from Bishop’s Funeral Home Chapel at 2:00 PM. Pastor Luke Weaver and Pastor Justin Beesley will officiate at the service. Interment in Benton, NB later. For those who wish to make a donation in memory of Emmett, the family suggests the Village Lighthouse, Benton, NB.